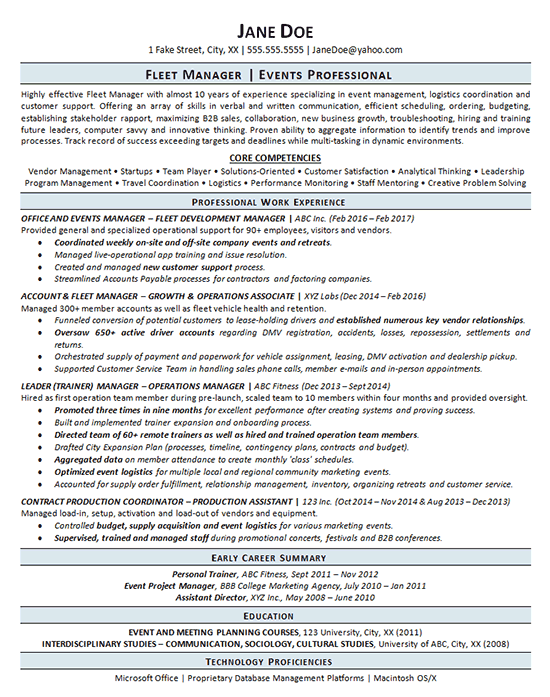 This resume was created for a Fleet Manager and Events Professional that has experience in a variety of operations development areas. The client held numerous positions in a fairly short time frame and was concerned about that raising red flags. This concern was addressed by starting the resume with an introductory paragraph and Core Competencies section to highlight the client’s strengths and attractive qualities to prospective employers. For the body of her professional experience, job titles were written in capital letters and bold font to put the focus on that instead of dates of employment. This should help protect against the employers first impressions being of a job hopper. Additionally, the most impactful statements were written in bold font to stand out more within her experience. Also, her earliest three jobs were simply listed in an Early Career Summary section to maximize space and impact. The resume concluded with Education and Technology Proficiencies sections to demonstrate the client’s well-rounded competency for these positions of interest. Highly effective Fleet Manager with almost 10 years of experience specializing in event management, logistics coordination and customer support. Offering an array of skills in verbal and written communication, efficient scheduling, ordering, budgeting, establishing stakeholder rapport, maximizing B2B sales, collaboration, new business growth, troubleshooting, hiring and training future leaders, computer savvy and innovative thinking. Proven ability to aggregate information to identify trends and improve processes. Track record of success exceeding targets and deadlines while multi-tasking in dynamic environments. Coordinated weekly on-site and off-site company events and retreats. Managed live-operational app training and issue resolution. Streamlined Accounts Payable processes for contractors and factoring companies. Funneled conversion of potential customers to lease-holding drivers and established numerous key vendor relationships. Oversaw 650+ active driver accounts regarding DMV registration, accidents, losses, repossession, settlements and returns. Orchestrated supply of payment and paperwork for vehicle assignment, leasing, DMV activation and dealership pickup. Supported Customer Service Team in handling sales phone calls, member e-mails and in-person appointments.